Written exam will be conducted for 120 marks for this Forest Guard jobs. Written exam will be held in the month of March or April 2019. Admit Card for this written exam will be available 10 days before the exam date. 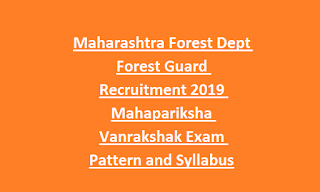 Candidates must have prepare the given syllabus topics to crack this Forest Guard Exam 2019. Written exam topics are English, Marathi, Marathi Language and General Knowledge. 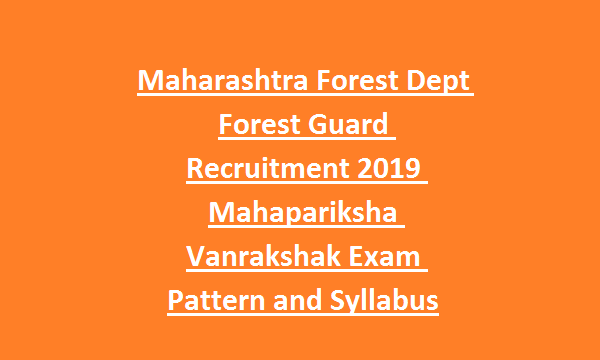 Exam Pattern and Syllabus, Syllabus PDF is updated below for this Mahapariksha Forest Guard Jobs recruitment Exam 2019. Written Exam for this Forest Guard jobs will be conducted for 120 marks. Total 120 questions will be given and exam duration in 200 Minutes. • Use of Idioms and phrases & their meaning and comprehension of passage. Cultural Events, Global, Current Affairs in India and the State, etc. relationships, mathematical rationality, logical explanation of details, direction etc.